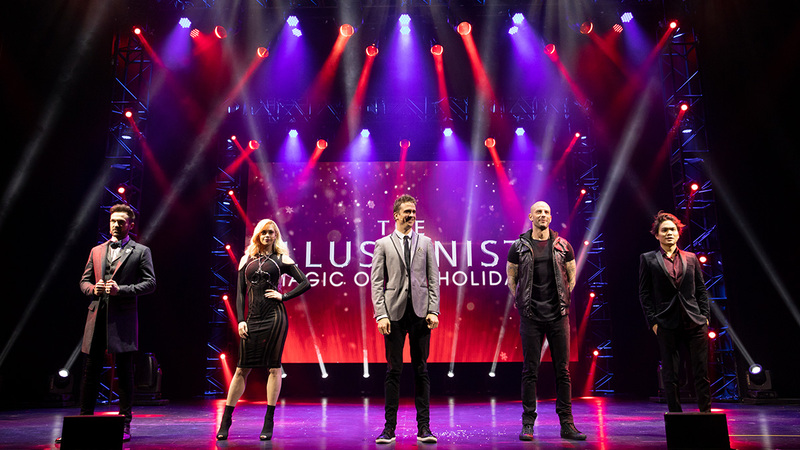 For the fourth year, the international magic franchise The Illusionists will return to Broadway this holiday season. The new extravaganza, titled Magic of the Holidays, will shine a spotlight on a handful of the world’s best magicians, including Chloé “The Sorceress” Crawford and Darcy “The Grand Illusionist” Oake. We recently caught up with Crawford and Oake to talk about bringing their acts to the Great White Way. Chloé, Darcy, you’re both making your Broadway debuts with The Illusionists: Magic of the Holidays. What does Broadway mean to you? Chloé: It means a lot to me, actually. I’ve been in Vegas for quite some time and there are a few places around the world where most performers dream of performing — places like Vegas and the West End and Broadway. I’m so honored to be sharing the stage with The Illusionists’ other amazing magicians. Darcy: To me, honestly, Broadway is the pinnacle. I feel like the most prestigious thing for any artist is to be on Broadway. Broadway is where real art happens. When did you first discover magic? Darcy: A funny story. It happened by chance. My mum used to play bridge when I was young — like 6 or 7 years old — and there was a deck of cards sitting on the kitchen table. And my dad said, “Darcy, pick a card.” And he has zero magic knowledge. So I picked a card out and put it back in the deck. He said, “I’m going to close my eyes and pick your card.” And sure enough, he spreads the deck out on the table and randomly pulls out a card, and it was my card. And I was blown away and begged him to tell me how he did it, and he wouldn’t tell me. Five weeks later, I learned that it was a total accident — the trick just worked out! It was that month where he wouldn’t tell me the secret; it just sunk in and I thought, “I want to be able to do that.” And I never looked back. Chloé: I watched a lot of magic on TV when I was a little girl. That always got to me. But I always thought the women were just assistants, and I always looked up to the women working behind the scenes. And as I got older I thought, “Hold on a second: There are no women fronting the performances, they are always the assistant. Why is that?” And that got me going. I like a challenge. Chloé, you got your start as a magician’s assistant. Chloé: I did. I was a dancer at 5 years old and performed professionally as a dancer all around the world, in front of thousands of people, at a very young age. And then I started assisting, and I’ve been lucky enough to see things on both sides of the magic box, if you will. And not a lot of men get to see that. As a magician I’m all about coming up with new things, not following the trend. Everyone sees everything online, so that really pushes me to raise the bar with my magic. How would you describe your magic? Darcy: I do larger theatrical illusions. Chloé: Mine’s a bit of a mix. Personally, I enjoy shocking people. Comedy magicians like to make people laugh, some people like to wow people. Where for me, I love when there’s a look on someone’s face and they’re just shocked. That’s what gets me excited. We call it “geek magic,” where you don’t know if it’s real or not. You’re definitely walking that line. What’s the craziest “geek” trick you’ve performed thus far? Chloé: I’ve done some crazy things, like tricks with razor blades, and they’re real. I’ve done a few things where I’ve sniffed things up my nose and pulled things out of my eyes and it is real. You can’t fake that; you can’t fake things coming out of your body and coming out of your skin. Chloé, you were a huge hit on Britain’s Got Talent. What was that experience like? Chloé: Britain’s Got Talent was amazing for me. It was one of the scariest moments of my life because I was pretty new at magic at the time. But I thought, “Why not take the risk and see what comes from it?” And it was one of the best decisions I’ve ever made. It progressed my career: I did the show and then started working immediately with Criss Angel, and then The Illusionists. Darcy, you too were a hit on Britain’s Got Talent, you made an appearance on America’s Got Talent, and you were part of Queen Elizabeth’s 90th birthday celebration. What’s been the most rewarding experience for you? Darcy: Broadway will be one of them! Definitely Britain’s Got Talent and performing for the queen — both were amazing. I never thought those things would happen to me. I never thought I would perform for the royal family. Right after Britain’s Got Talent happened, all of these doors started to open for me, and the game really changed. Chloé, the magic industry still seems to be dominated by men, yet you are breaking the glass ceiling and making your mark all around the world as a celebrated female magician. Bringing the conversation back to Broadway: Everyone remembers their first Broadway show. What was yours? Chloé: My first show was Rent on Broadway. Darcy: For me it was The Lion King. I recently saw The Play That Goes Wrong and it was absolutely brilliant. I would say that it’s up there as one of my favorites. Coming from a theatrical world, it’s funny, because you understand that if something is not preset, things can go south. So watching that show, I could totally relate to it. What will be going through your minds on opening night when you make your Broadway debuts? Darcy: I think it’s the same thing that goes through my mind when I’m playing a big venue or performing for the queen: I just tell myself it’s another show. When you get caught up with “This is a big one and it has to go right,” then your whole aura changes. The best mind-set and attitude I can have is laid-back and just doing my job. I’m just going to approach it like any other show. Chloé: I’ll be relieved that the first one is done. I definitely want to do everyone proud and make everyone happy. And I’m sure there will be tears — because I’ll be happy.